There are a lot of things you could call the Dartz Prombron, but small, economical and svelte certainly aren't among them. The hulking Latvian SUV is about as brutish as they come, and while Dartz has ventured into sleeker territory with the Nagel concept, that's little more than a cut-down Prombron made for towing speedboats. This, however, is something else entirely. Looking like something you might expect to see in the archives at Bertone or Giugiaro (or on the set of the next Alien vs. 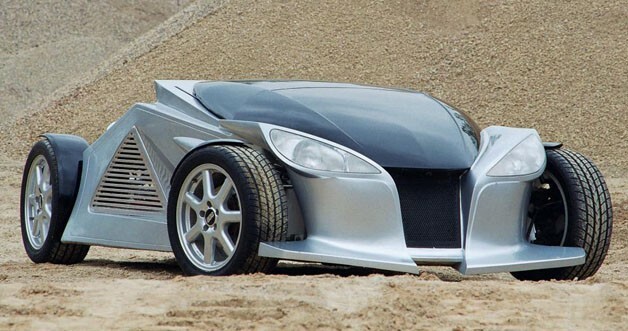 Predator movie), the Mojo is a new roadster being developed by Dartz. The shape is both curvaceous and angular (and strange...), with the engine exposed in the back (though no word yet on what engine that is) and two motorbike-style exhaust silencers protruding into the air. A glass canopy can be closed or slid backwards for ingress, egress and open-air motoring. There's even an electric version in the works called Jo-Mojo. Funny names since, unlike some of its other offerings, this Dartz vehicle actually isn't upholstered in foreskin. At least, we assume it isn't. The Mojo is set to be showcased at the 2012 Top Marques Monaco show at the Grimaldi Forum in Monte Carlo come April, by which time Dartz will presumably offer a little more in the way of technical details. In the meantime you can check out the photos in the gallery for a closer look.